One of the "winter finches," nesting in the Arctic and sometimes invading southern Canada and the northern states. 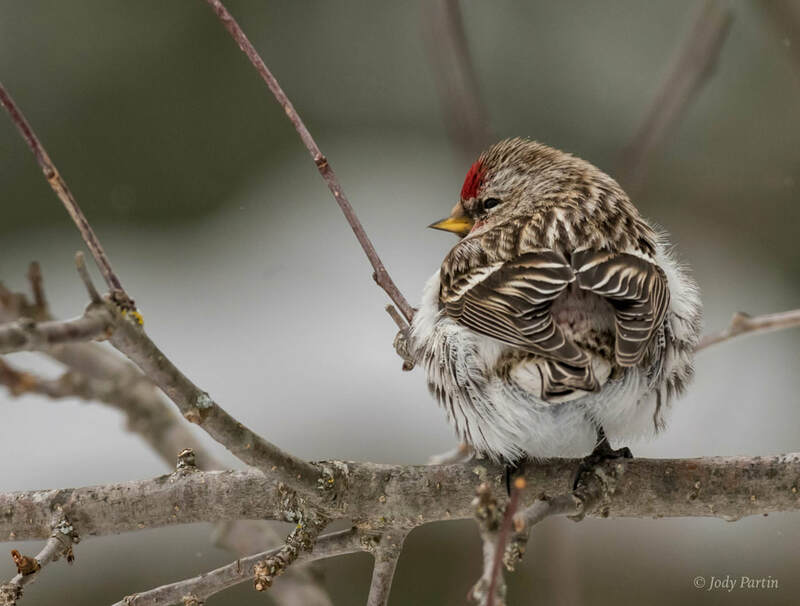 Redpolls are tiny, restless birds, feeding actively on seeds among trees and weeds, fluttering and climbing about acrobatically, their flocks seemingly always on the move. 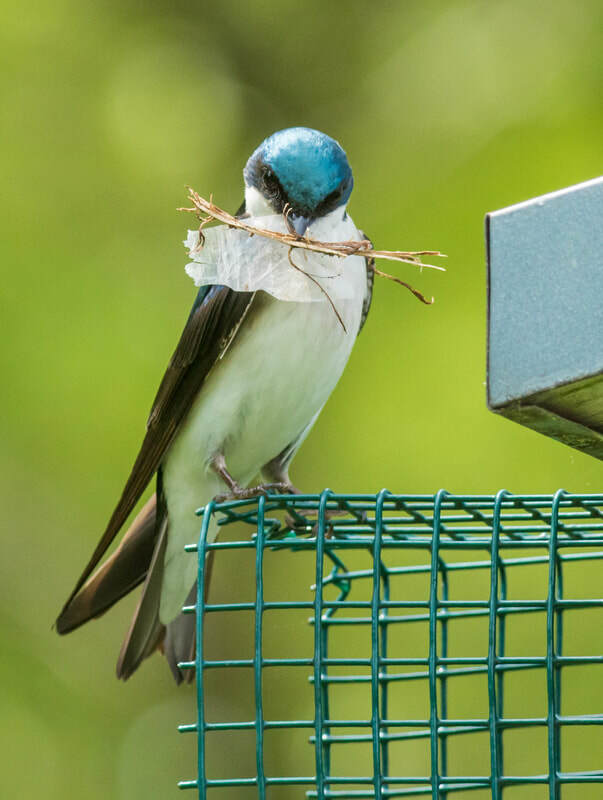 ​ For their small size, they have a remarkable ability to survive cold temperatures; their southward flights are sparked by temporary scarcity of food in the North, not by cold. At bird feeders in winter, redpolls are often remarkably tame. Forages very actively in trees, shrubs, weeds, and on the ground. Except when nesting, usually forages in flocks. Has a pouch within throat where it can store some food for up to several hours; this helps the bird in bitterly cold weather, allowing it to feed rapidly in the open and then digest food over a long period while it rests in a sheltered spot. Four to Five, rarely up to 7. Pale green to blue-green, with purplish to reddish brown spots often concentrated at larger end. Incubation is by female only, about 10-11 days. Male feeds female during incubation. Young: Fed mostly by female; contribution by male varies. Young leave the nest about 12 days after hatching. Mostly seeds, some insects. Diet for most of year is mostly seeds and other vegetable matter. Feeds on catkins, seeds, and buds of willows, alders, and birches, small conifer seeds, also seeds of many weeds and grasses. Also eats insects, mainly in summer. Males dominate females in winter flocks, but as breeding season approaches, females become dominant and may take the lead in courtship. Does not seem to defend much of a nesting territory; nests of different pairs may be close together. The nest is usually very well hidden in dense low shrubs, within a few feet of the ground, sometimes in grass clumps or under brushpiles. Nest (probably built by female) consists of fine twigs, grass, moss, lined with feathers (especially ptarmigan feathers), plant down, or animal hair. The barn swallow is a bird of open country that normally uses man-made structures to breed and consequently has spread with human expansion. It builds a cup nest from mud pellets in barns or similar structures and feeds on insects caught in flight. This species lives in close association with humans, and its insect-eating habits mean that it is tolerated by humans. 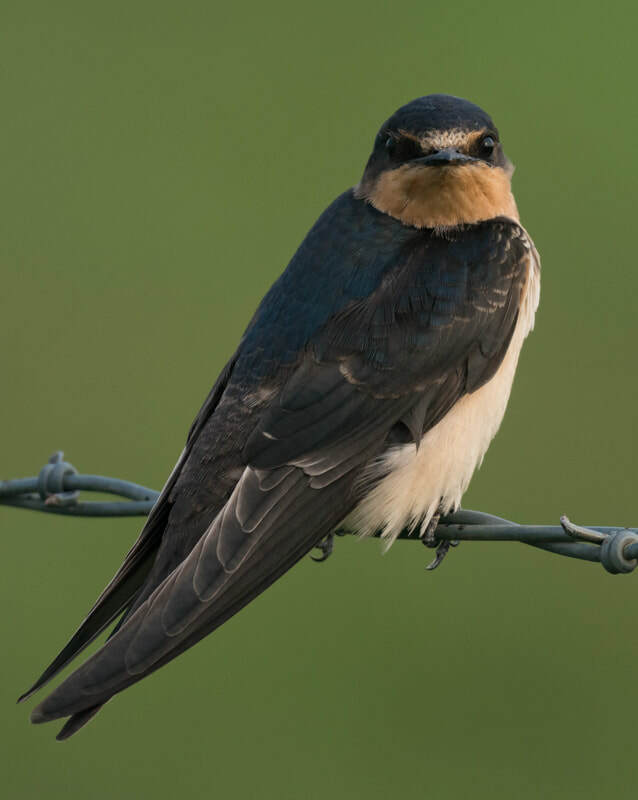 The barn swallow is similar in its habits to other aerial insectivores, including other swallow species and the unrelated swifts. It is not a particularly fast flier, with a wing beat rate of approximately 5, up to 7–9 times each second. 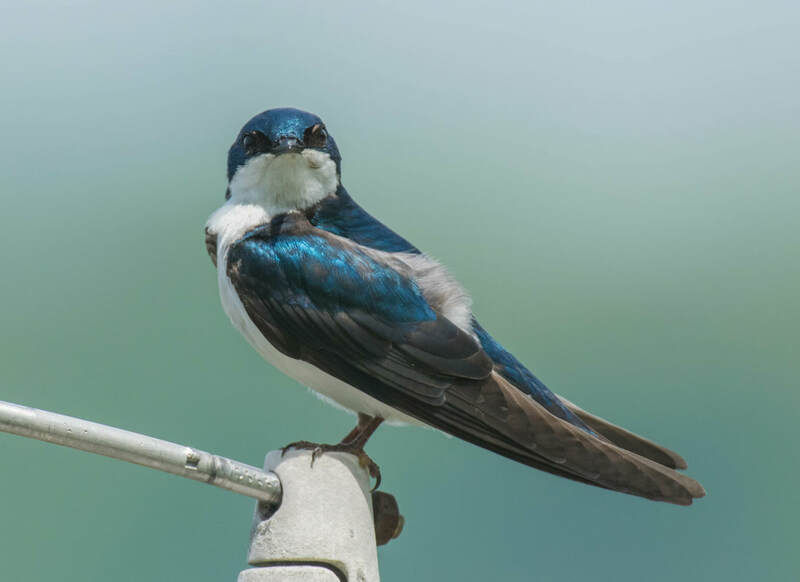 The barn swallow typically feeds in open areas (23–26 ft) above shallow water or the ground often following animals, humans or farm machinery to catch disturbed insects, but it will occasionally pick prey items from the water surface, walls and plants. In the breeding areas, large flies make up around 70% of the diet, with aphids also a significant component. The breeding season of the barn swallow is variable; in the southern part of the range, the breeding season usually is from February or March to early to mid September, although some late second and third broods finish in October. In the northern part of the range, it usually starts late May to early June and ends the same time as the breeding season of the southernmost birds. Both sexes defend the nest, but the male is particularly aggressive and territorial. Once established, pairs stay together to breed for life. As its name implies, the barn swallow typically nests inside accessible buildings such as barns and stables, or under bridges and wharves. Before man-made sites became common, it nested on cliff faces or in caves, but this is now rare. The neat cup-shaped nest is placed on a beam or against a suitable vertical projection. It is constructed by both sexes, although more often by the female, with mud pellets collected in their beaks and lined with grasses, feathers, algae or other soft materials. After building the nest, barn swallows may nest colonially where sufficient high-quality nest sites are available. There are normally two broods, with the original nest being reused for the second brood and being repaired and reused in subsequent years. The female lays two to seven, but typically four or five, reddish-spotted white eggs. The incubation period is normally 14–19 days, with another 18–23 days before the altricial chicks fledge. The fledged young stay with, and are fed by, the parents for about a week after leaving the nest. Occasionally, first-year birds from the first brood will assist in feeding the second brood. Compared to those from early broods, juvenile barn swallows from late broods have been found to migrate at a younger age, fuel less efficiently during migration and have lower return rates the following year. This big "Honker" is among our best-known waterfowl. In many regions, flights of Canada Geese passing over in V-formation -- northbound in spring, southbound in fall -- are universally recognized as signs of the changing seasons. Once considered a symbol of wilderness, this goose has adapted well to civilization, nesting around park ponds and golf courses; in a few places, it has even become something of a nuisance. Local forms vary greatly in size, and the smallest ones are now regarded as a separate species, Cackling Goose. 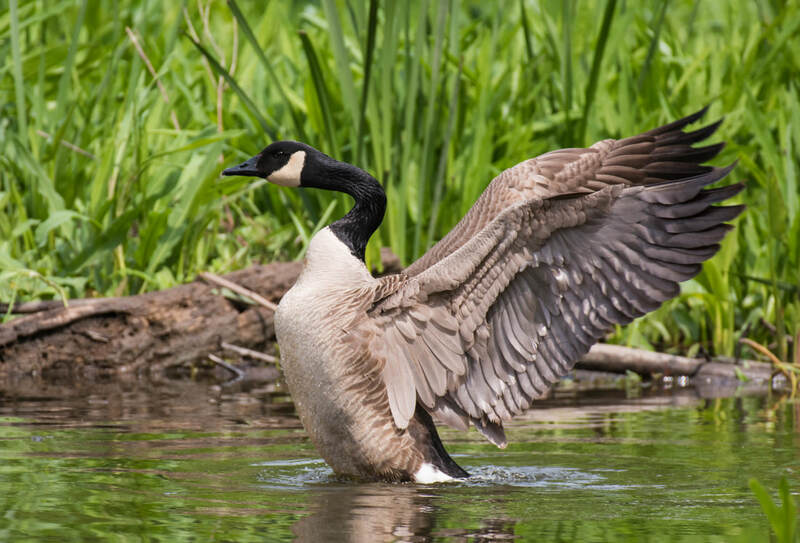 Canada Geese forage mostly by grazing while walking on land; they also feed in water, submerging their head and neck, sometimes up-ending. It Feeds in flocks at most seasons. Usually 4-7, sometimes 2-11. White, becoming nest-stained. Incubation is by female, 25-28 days; male stands guard nearby. Young: Parents lead young from nest 1-2 days after hatching. Parents lead young from nest 1-2 days after hatching. Young are tended by both parents, but feed themselves. Age at first flight varies, usually 7-9 weeks, tending to be longer in the largest forms. These geese feed almost entirely on plant material. They feeds on very wide variety of plants, eating stems and shoots of grasses, sedges, aquatic plants, also seeds and berries. They consume many cultivated grains (especially on refuges, where crops planted are for geese). Occasionally they will eat some insects, mollusks, crustaceans, and sometimes small fish. May mate for life. Male defends territory with displays, including lowering head almost to ground with bill slightly raised and open, hissing; also pumps head up and down while standing. Nest site (chosen by female) is usually on slightly elevated dry ground near water, with good visibility. Much variation; may nest on cliff ledges, on muskrat houses, in trees, on artificial platforms. Nest (built by female) is slight depression with shallow bowl of sticks, grass, weeds, moss, lined with down. Muskrats are unique, semi-aquatic rodents named for their musky smell and rat-like appearance. They're known mostly for their destructive burrowing in ponds, streams and dams, but there's more than this to these large wetland-dwelling mammals. 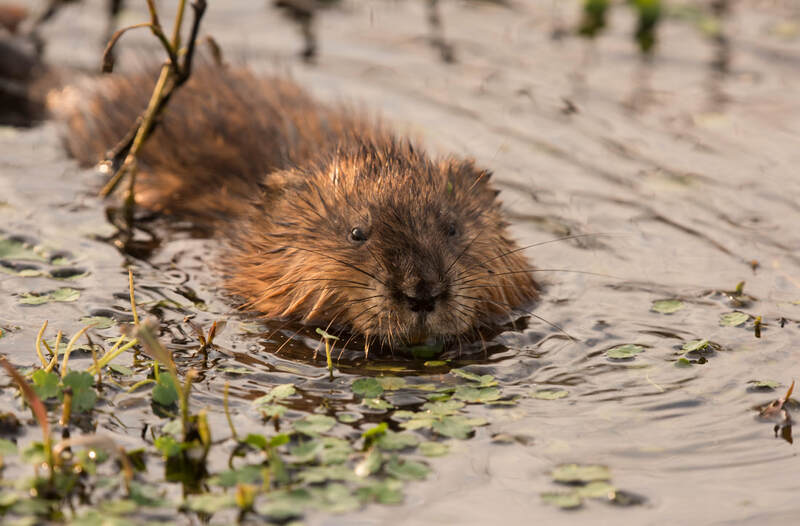 The muskrat and its bigger cousin, the beaver, are the only mammals that actually build homes in the water. That is where they spend the winter and raise their young. General description: The muskrat swims low in the water, with its long, almost-hairless tail curling behind. Often, the muskrat can be seen carrying aquatic vegetation as it swims. Length: The muskrat is about 20 inches long, including its 9-inch tail. Weight: Adults weigh from 2 to 5 pounds. Muskrats produce many young. An adult female can have two or three litters of up to 10 young each summer. The young weigh about one-half ounce at birth, but grow rapidly and can live on their own after only one month. Muskrats eat the roots, stems, leaves, and fruits of a many water plants, such as cattail, wild rice, water lilies, and rushes. Even though the muskrat is mainly a plant eater, it also eats small fish, clams, snails, and even turtles. The muskrat's main predators are mink and otters. Some raptors (bird predators) such as eagles and ospreys will attack swimming muskrats. When on land, muskrats are vulnerable to predation by foxes, coyotes and raccoons. The muskrat is native to North America and is an introduced species in parts of Europe, Asia, and South America. The muskrat is found in wetlands over a wide range of climates and habitats. It lives in marshes, ponds, and streams that have many water plants. Several hundred muskrats can live in a single wetland. Although famous for its domed houses of mud and vegetation, it just as often lives in burrows. A valuable furbearer, the muskrat provides income for trappers of all ages. Trapping, of course, helps to keep these prolific animals in balance with their habitat. Muskrats have several litters each season. If they become overly-abundant, they may create problems by digging holes in dikes and dams or tunneling out bank dens along lake and river shorelands. Unlike the beaver, the muskrat does not store food for the winter. It needs to eat fresh plants each day, and sometimes it makes channels in the mud to get from its house to reach food under the ice. To stay warm in winter, groups of muskrats huddle together in their lodges. Fishers are covered with dark brown, nearly black fur. Head and shoulders are covered with light-colored fur with white tips that create a grizzled appearance. Females have softer fur than males. Fur is glossy and dense during the winter and light-colored and less dense during the summer. A fisher has a slender body, short legs and a long, bushy tail. Large paws are equipped with sharp, retractable claws (they can be hidden inside the paws) which facilitate climbing trees. Fishers mainly feed on meat (carnivores). Their diet is based on snowshoe hares, rabbits, mice, squirrels, shrews, porcupines, and birds. Fishers hunt their prey using the element of surprise although they occasionally eats berries, fruit, mushroom and beechnuts. Despite its name, fishers rarely eats fish. Fishers rest in the crevices of rocks and abandoned nests of squirrels and birds (tree cavities) during the day. 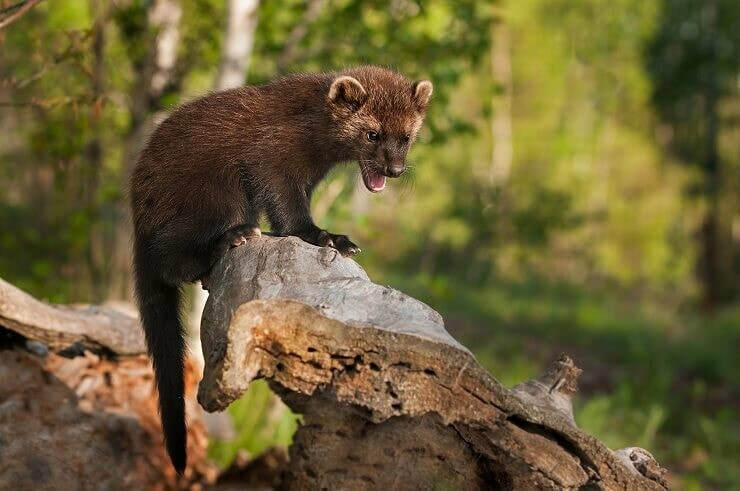 A fisher produces hissing and growling sounds when it is threatened. Humans are the main predators of fishers. 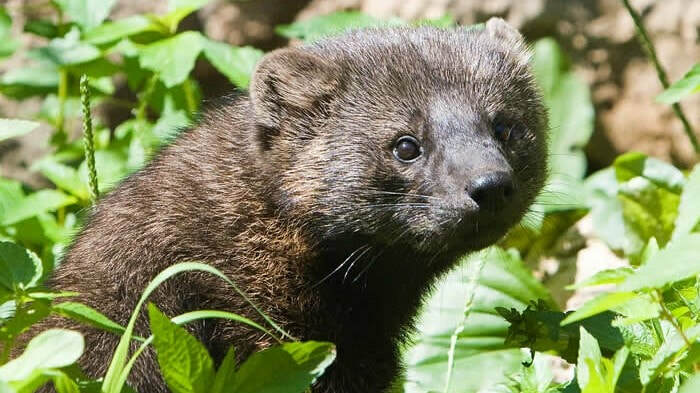 Fishers use a substance from the gland in their hind paws to mark their trails during the breeding season (males and females can find each other thanks to this substance). Mating season of the fisher takes place during April. Females are able to delay pregnancy. Fertilized eggs will start to develop 9 to 10 months after copulation. Embryonic development lasts 50 days. 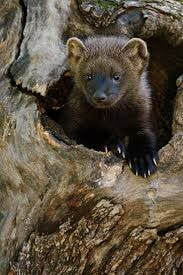 Females give birth to 1 to 4 (usually 3) babies (called kits) in the dens in cavities of trees. Babies are blind and nearly naked at birth. Only the mother takes care of the babies. Kits depend on their mother's milk during the first 8 to 10 weeks of their life. After that, they start to eat solid food. Young fishers become independent at the age of 5 months and reach ​sexual maturity at the age of one year. A fisher can survive 10 years in the wild. What you Didn't Know About Chipmunks. . . .
​​ Starting in late October, they fall into a deep sleep with a slowed heart rate and lower body temperature for extended periods until March or April. Unlike bears, though, chipmunks don’t bulk up their fat stores to sleep through the entire cold season. 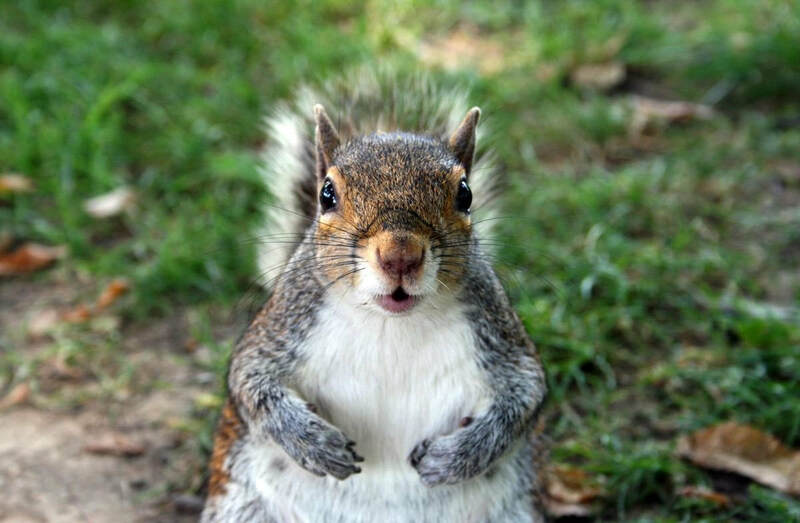 Instead they wake periodically to dip into their stockpile of nuts and seeds and even venture outside. At least that’s true of chipmunks in captivity. If their wild cousins require the same amount of snooze time, then all that zippy scampering you see outside has to get done during a nine-hour window each day, says Wildlife Animal Control. 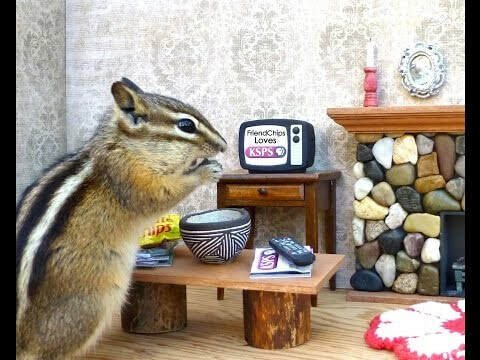 Despite their reputation for cuddly camaraderie in cartoons, real chipmunks don’t bear much resemblance to their big-screen counterparts. In fact, they’re mostly solitary creatures — at least until breeding season arrives. Twice a year in spring and late summer, males (called bucks) and females (does) come together to mate, then part ways again. Female chipmunks raise the pups, but don’t remain close to their offspring once they leave. Baby chipmunks (called kits, kittens or pups) are born blind, hairless and helpless. Imagine something that looks like a pink jelly bean. Pups develop quickly, though, and leave the nest by 4 to 6 weeks of age to make their own way in the world. Weighing in at 1 to 5 ounces, chipmunks are the most diminutive members of the squirrel family, according to the National Wildlife Federation. That means these pocket-sized rodents are also related to woodchucks and prairie dogs, which share a branch on the squirrel family tree as well. There are 25 species of chipmunks, ranging mostly from Canada to Mexico across a variety of stomping grounds from forests to deserts to suburban neighborhoods, according to National Geographic. Only one species, the Siberian chipmunk, makes its home outside North America, scampering over much of northern Asia as well as in Europe where it was introduced via the pet trade in the 1960s. While some chipmunks make nests in logs or bushes, most prefer to dig vast underground burrows. These hidden homes typically include a camouflaged entrance hole, tunnel systems that can stretch 10 to 30 feet long, food storage areas and a nesting chamber (which is kept immaculately clean and lined with leaves and other plant matter). Chipmunks aren’t picky eaters and spend a lot of time searching for their next meal, including at bird feeders (as many annoyed homeowners can attest). These omnivores love nuts, berries, seeds, mushrooms, insects, frogs, lizards, baby birds and bird eggs. During late summer and fall, they begin carrying extra food back to their burrow in their ample cheek pouches (which can hold a stash three times the size of their head). 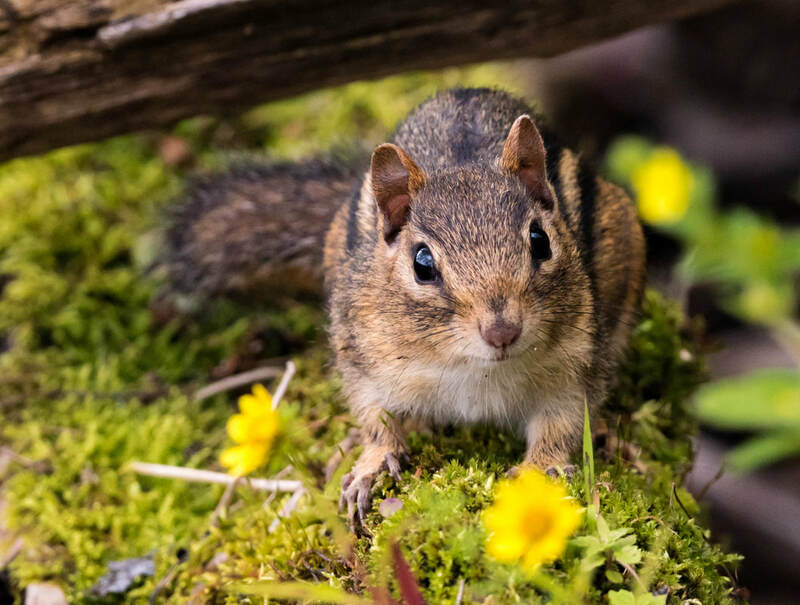 This foraging also benefits the larger ecosystem — chipmunks spread seeds and important mycorrhizal fungi that live around tree roots, ensuring they thrive. Just about any carnivore bigger than one of these bitty critters is a potential threat. Think owls, hawks, weasels, foxes, coyotes, raccoons, bobcats, lynxes, cats, dogs, snakes, and sometimes even their own red squirrel cousins. Chipmunks avoid becoming meals by being quick and nimble — and sticking close to home. These super-speedy escape artists remain ever vigilant while out foraging for food, racing away at the first sign of danger down their burrow hole, into the brush or even up a tree. 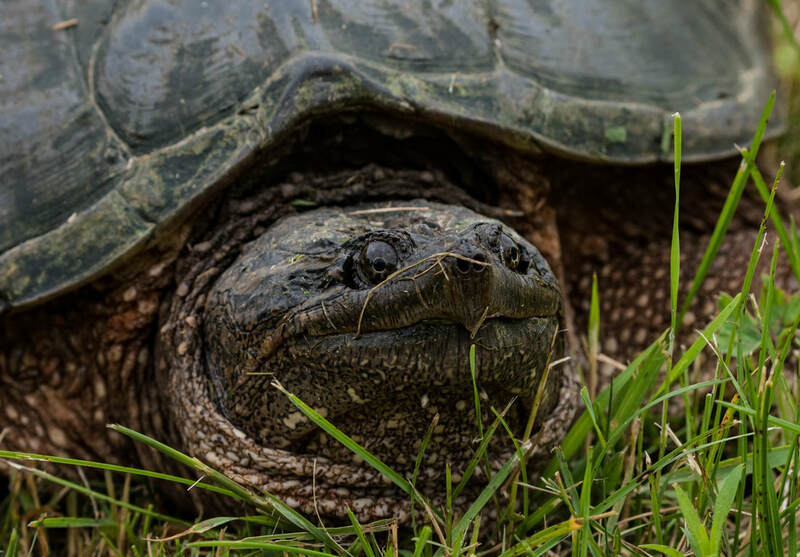 These snapping turtles were photographed in McNaughton, Wisconsin by Jody Partin. 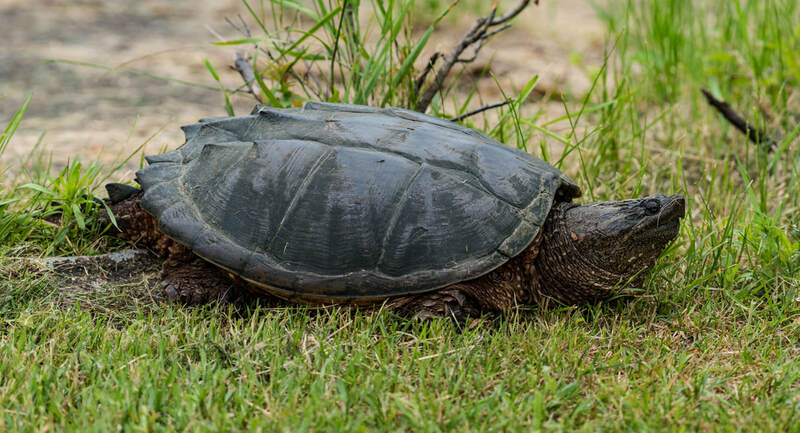 ​ Common snapping turtles are actually quite omnivorous, eating aquatic plants, as well as aquatic insects, tadpoles and crayfish. Adults will scavenge dead fish, but are unlikely to capture healthy game fish, a crime they are often accused of. Juveniles will consume turtle pellets in captivity. ​ A small species, it reaches about 30 cm (12 in) in length including the tail, and a weight of 66–150 g (2.3–5.3 oz). It has reddish-brown fur on its upper body and five dark brown stripes contrasting with light brown stripes along its back, ending in a dark tail. 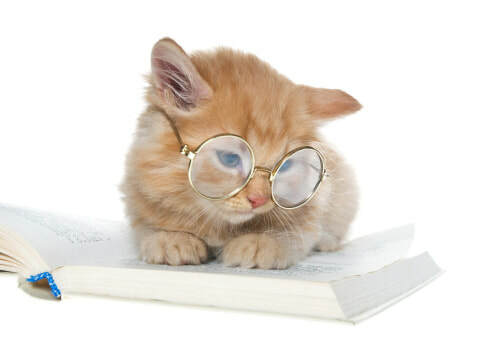 It has lighter fur on the lower part of its body. It has a tawny stripe that runs from its whiskers to below its ears, and light stripes over its eyes. It has two fewer teeth than other chipmunks and four toes each on the front legs, but five on the hind legs. The eastern chipmunk lives in deciduoous wooded areas and urban parks throughout the eastern United States and southern Canada. It prefers locations with rocky areas, brush or log piles, and shrubs to provide cover. The eastern chipmunk defends its burrow and lives a solitary life, except during mating season. Females usually produce one or two litters of three to five young. The two breeding seasons are from February to April and from June to August. During the winter, the chipmunk may enter long periods of torpor, but does not truly hibernate. 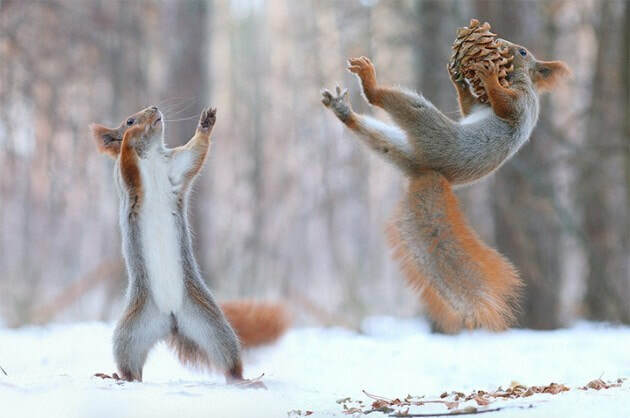 Predators of the eastern chipmunk include hawks, foxes, raccoons, weasels, snakes, bobcats, lynx, and domestic cats. On average, eastern chipmunks live three or more years in the wild, but in captivity they may live as long as eight years. Sphinx moths are larger than most moths and the White-Lined Sphinx Moth is no exception. Their forewings are mostly brown, but each has a thick white line that extends from the base (by the head) to the tip of the wing. Thin white lines cross this thicker one in spaced intervals from the left to the right side of each forewing. The tops of the hindwings each have a flash of bright pink that is only visible when the moth completely spreads its forewings ('top' wings) open. The White-Lined Sphinx Moth hovers over flowers, much like a bird, and can be found in a variety of habitats. It is very hairy so it could be mistaken as a small bird if not closely observed. The species is active both day and at night. They are attracted to lights and many of them may congregate together at a light source at night. The caterpillar comes in a wide variety of colors. A more mature caterpillar is horned and can be black with yellow lines on the sides. The immature caterpillar is known to feed on a large variety of plants, but more mature ones tend to prefer evening primrose and roses. This species is known to have population explosions in drier country. Its enormous range covers most of North America. ​ This creature video comes to you from the backyard of Chuck and Cyndy Devereaux from Sugar Camp in Oneida County. to restore a site that had previously been covered in the invasive Yellow iris. Brilliant orange-and-black monarchs are among the most easily recognizable of the butterfly species that call the Americas home. Their migration takes them as far north as Canada and, during the winter months, as far south as Mexico City. A single monarch can travel hundreds to thousands of miles. The monarch migration is one of the greatest natural phenomena in the insect world. Monarchs are truly spectacular migrants because the butterflies know the correct direction to migrate, even though they have never made the journey before. They follow an internal "compass" that points them in the right direction each spring and fall. Like viceroy butterflies, which mimic the appearance of the monarch, this butterfly is bright orange with black and white markings. The body of the monarch is black, and the head has a set of antennae. The wings are mostly orange with black veins running throughout. The outer edge of the wings has a thick black border. Within the black border are white spots. The white spots can range in size, and they decorate the wings. At the upper corner of the top set of wings are orange spots. The underside of the monarch butterflies' wings can be seen when the butterfly is at rest or when it is feeding on a flower. Instead of bright orange, the underside is more drab and orange-brown. Males and females can be told apart by looking at the top of their hind wings. Males have a black spot at the center of each hind wing, while the females do not. The spot is a scent gland that helps the males attract female mates. Another less accurate way to tell males from females is that the females usually have much thicker veins than the males. Monarch butterflies have a wingspan of 3.5 to 4.8 inches (9 to 12 centimeters). Monarch butterfly caterpillars are also easy to identify. The caterpillars have many yellow, black, and white bands. There are antenna-like tentacles at each end of the caterpillar's body. A much smaller population of monarch butterflies lives west of the Rocky Mountains. Instead of making the long journey between Mexico and Canada, the western monarchs only travel as far south as San Diego, California. Some monarchs live in California year-round and others spend summers as far north as British Columbia, Canada. Hawaii also has monarch butterflies. Monarchs that were released or lost their way from California have found success year-round on the Hawaiian Islands. Monarch butterflies utilize different habitat in the warm months versus the cold months. In the spring, summer, and early fall, they can be found wherever there are milkweeds. Monarchs lay their eggs on milkweeds, and they're always searching for them in fields, meadows, and parks. Many people plant milkweeds in their gardens. Monarchs cannot survive freezing temperatures, so they pass the winter in the cool, high mountains of central Mexico and woodlands in central and southern California. Monarchs, like all butterflies, change their diet as they develop. During the caterpillar stage, they live exclusively on milkweed plants. Milkweeds are wildflowers in the genus Asclepias. Milkweeds contain glycoside toxins that are harmless to the monarch, but poisonous to its predators. Monarch caterpillars feed on all the different parts of the milkweed plant and store up the toxins in their body. The toxins remain in their system even after metamorphosis, thereby making adult monarchs poisonous as well. Adult monarchs feed on nectar from a wide range of flowers, including milkweeds. The monarch population has declined by more than 90 percent since the 1990s. The monarch butterfly faces several risks. Climate change alters the timing of migration and rainfall patterns in their forest habitat. They're also facing forest fragmentation and habitat loss in the United States and Mexico. In addition, pesticides kill milkweed, which the monarchs rely on for survival. The U.S. Fish & Wildlife Service is currently reviewing their status. The grapeleaf skeletonizer is a moth in the family Zygaenidae. It is widespread in the eastern half of the United States, and commonly noticed defoliating grapes, especially of the Virginia creeper. The western grapeleaf skeletonizer is very similar to and slightly larger than H. americana, but their distributions are different. Larvae are yellowish and have black spots or bands. They are slightly more than 1/2 inch long when mature. Adult moths are uniformly black except for a yellowish or orange collar. The antennae are pectinate in both sexes and plumose in the male. The forewings are four times as long as wide and more than twice the area of the hind wings. The abdomen is usually curled upwards and expanded at the tip into a fan-shaped, somewhat bilobed caudal tuft. Length of the moth is 8 to 12 mm, while the wing expanse is 22 to 28 mm. ​ The average length of the life cycle as 66.7 days and minimum life cycle is 53 days. Average length of the egg stage is nearly eight days, larval stage-40 days, pupal stage-15 days, and length of life of the adult moth as 3.5 days. Time To Build Bat Houses! ​ Bats are emerging from hibernation in caves and mines, and migrating back from overwintering sites in the south. Bats are deciding where to spend the summer and exploring sites, so right now is a great time to put up a bat house. Find a supply list, instructions, and videos to build a bat house. it's a great project! Get started.